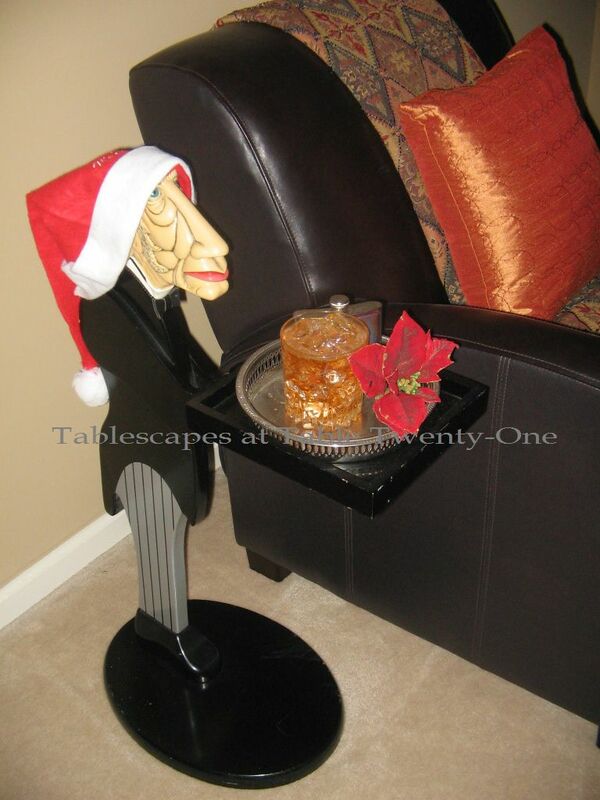 This isn’t a tablescape, but I thought you might like to see the decor around the main floor of our home for Christmas 2011. I didn’t have to spend one thin dime (lucky me, because I don’t have one to spare! ), but I had a ball rifling through all the decor stored in crates that I have either never used or haven’t worked with for a while. We may have had to scale way back this year, but I think it’s pretty…and very, very red!!! Upon entering the front door, this is the view up the stairwell. I love lots of candlelight! 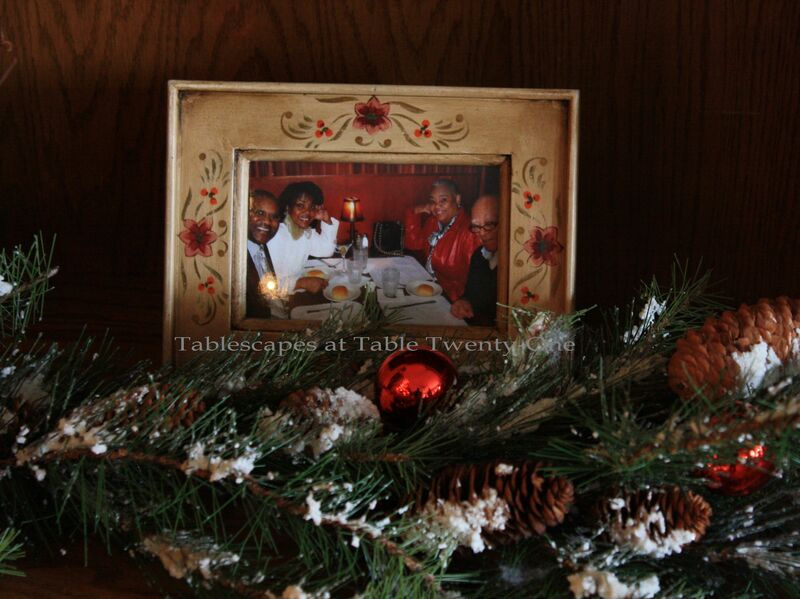 This works beautifully for Christmas or even for a candlelight wedding anytime of year. These are all LEDs for safety’s sake, of course! 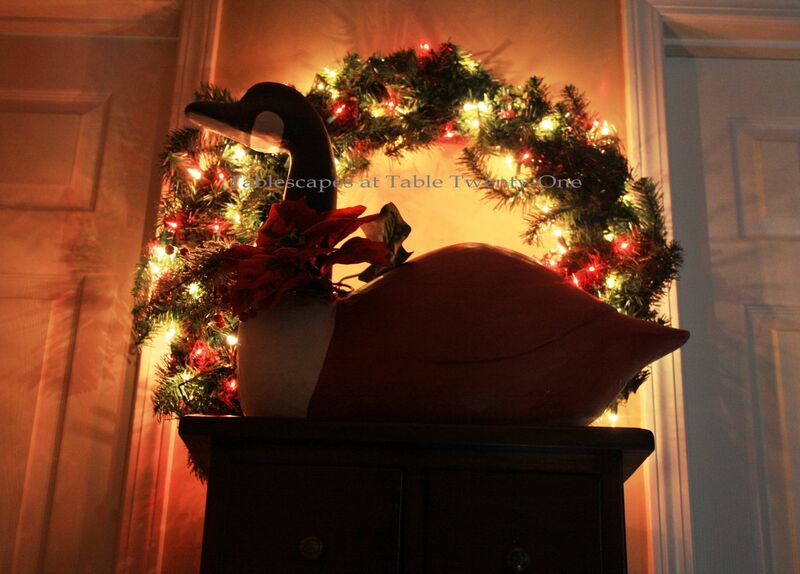 At the very top of the stairs is this goose from the family room all dressed up for Christmas. 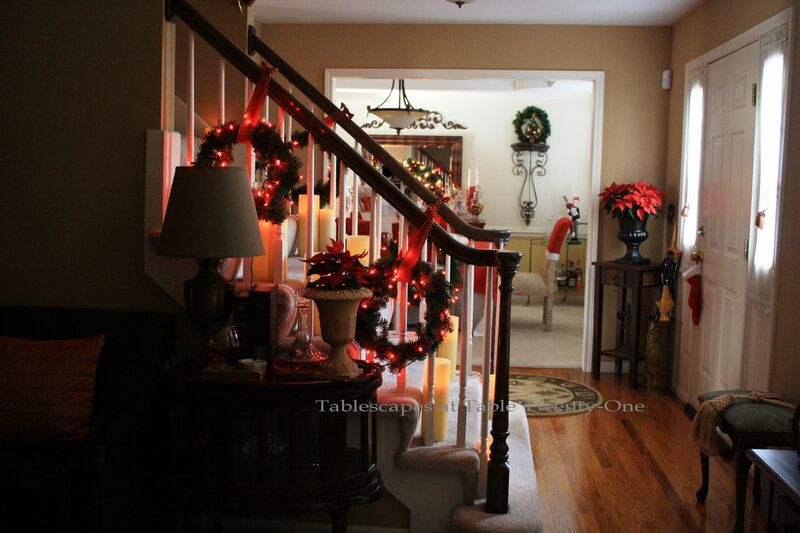 The banister in the front entry hall is adorned with lighted wreaths hung with the same gold polka-dotted red velvet ribbon used inside and out this year. The poinsettia by the front door was a gift from our neighbor. 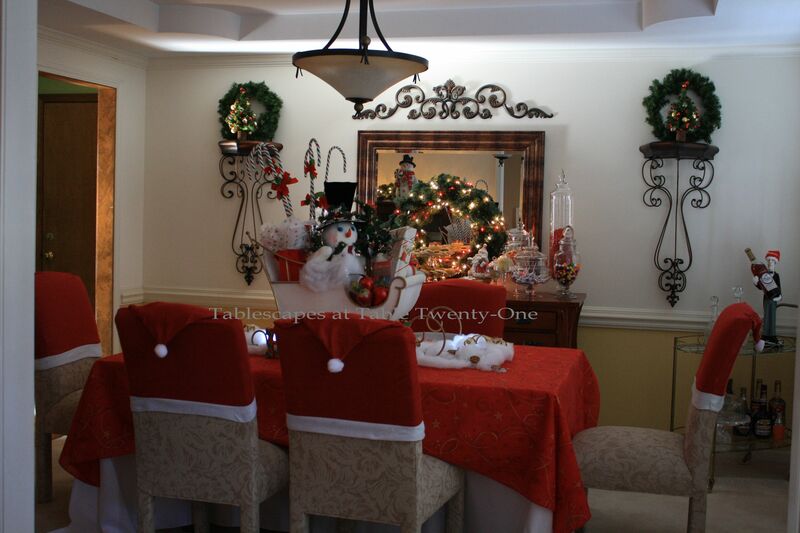 I dressed the dining room to replicate as closely as possible the same decor I used for the children’s Christmas party earlier this season sans tableware. (Click HERE to see the children’s party post.) I also added a few wreaths to dress it up a bit more. Across the hall in the library is a reproduction Louis XIV vitrine that we use as another bar. 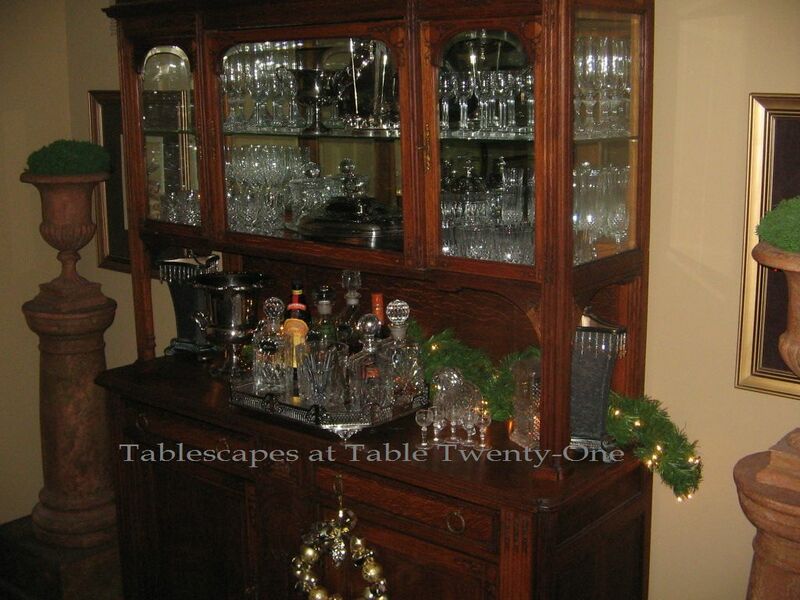 It is dressed in lighted greenery that reflects beautifully behind the crystal decanters. 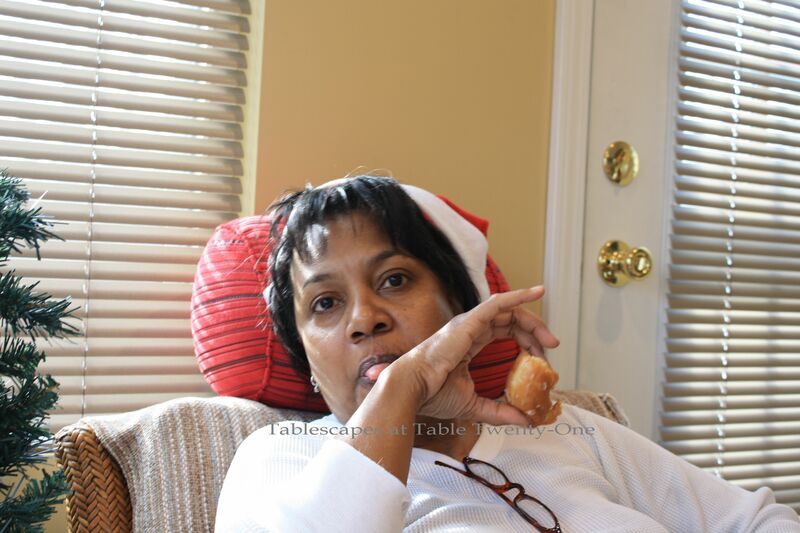 On the opposite side of the room is a secretary with multiple Christmas trees and lighted greenery on top. Our faithful servant, Geoffrey, is delighted (NOT!) to serve up a Christmas cocktail! 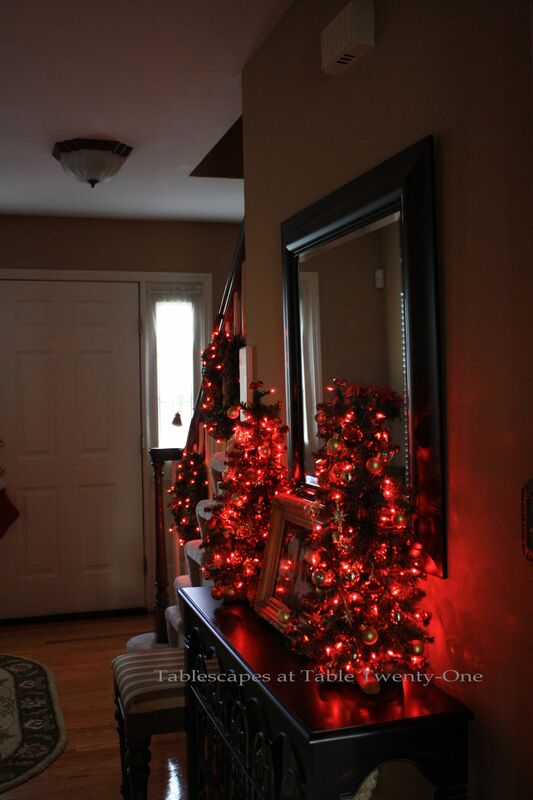 Back out into the foyer heading into the family room is a narrow table with two small decorated trees laden with red lights that cast a warm glow on the family photo in the center. 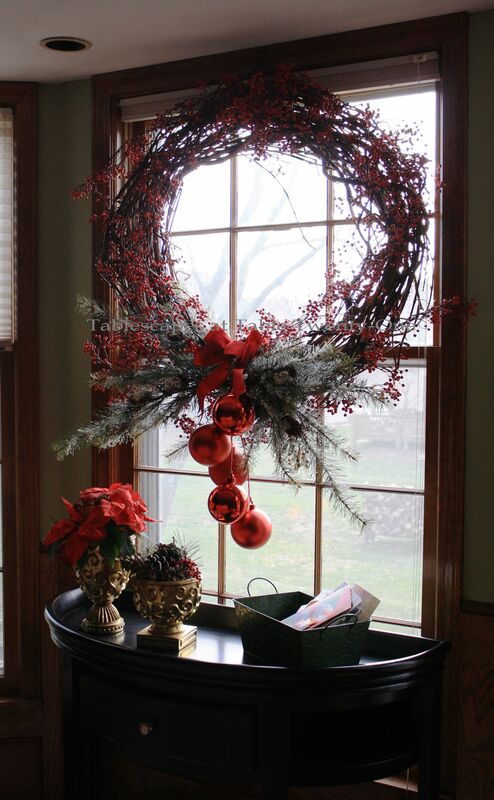 The family room window has a large grapevine wreath dripping with red berries, oversized ornaments, and frosted pinecone greenery. 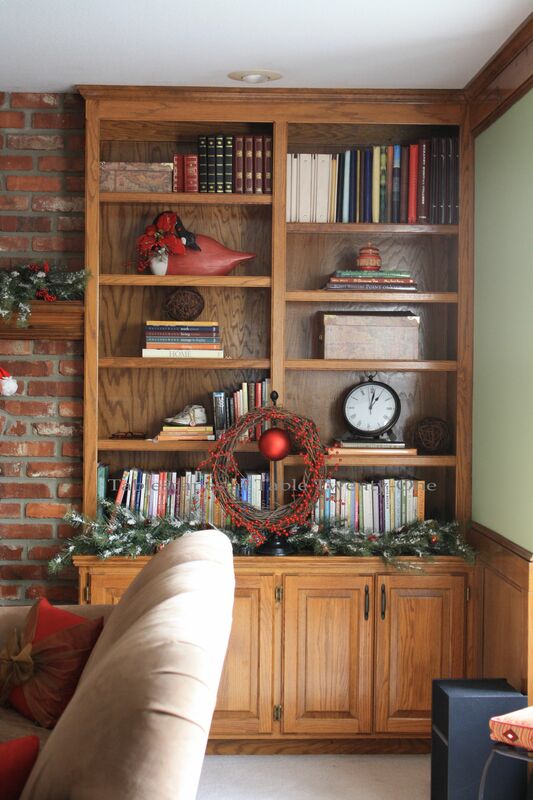 The bookshelves are treated with pinecone greenery dotted with shiny red ornaments and berry-filled grapevine wreaths. 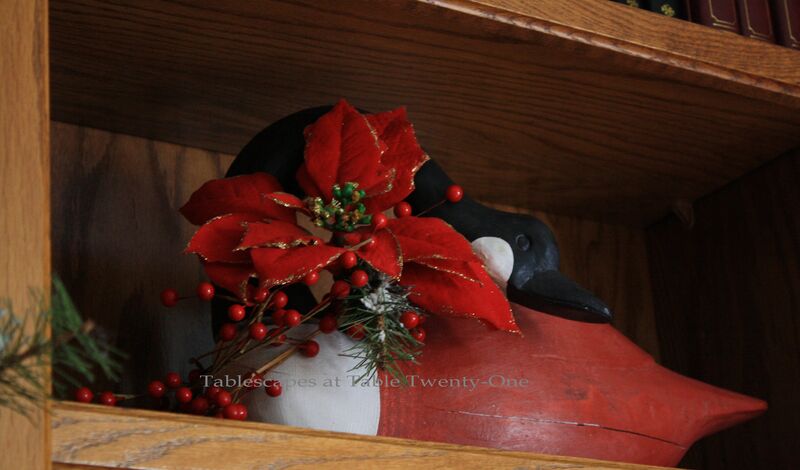 Another goose is all decked out for the holidays, and one of my favorite photos with my parents enjoys a special place of honor near the tree. …to this AFTER. We had considerably less floor space to work with this year, so a smaller tree was the solution. I ditched most of the ornaments that came with the tree, so it is now drizzled with red ornaments and berry clusters illuminated by soft white lights. 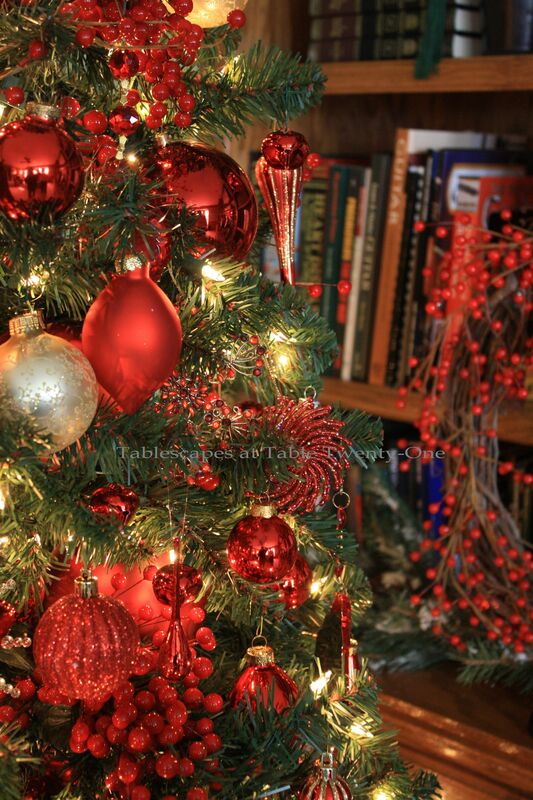 I was surprised by just how many red ornaments I have amassed over the years! The “skirt” is a length of artfully scrunched gold silk fabric. 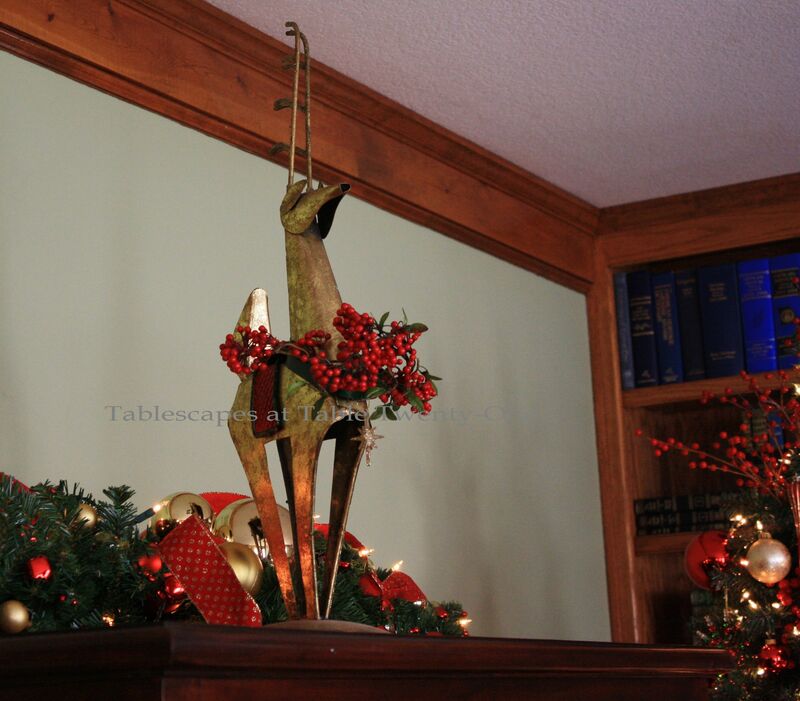 A smaller version of the reindeer by the fireplace stands guard atop the television armoire. 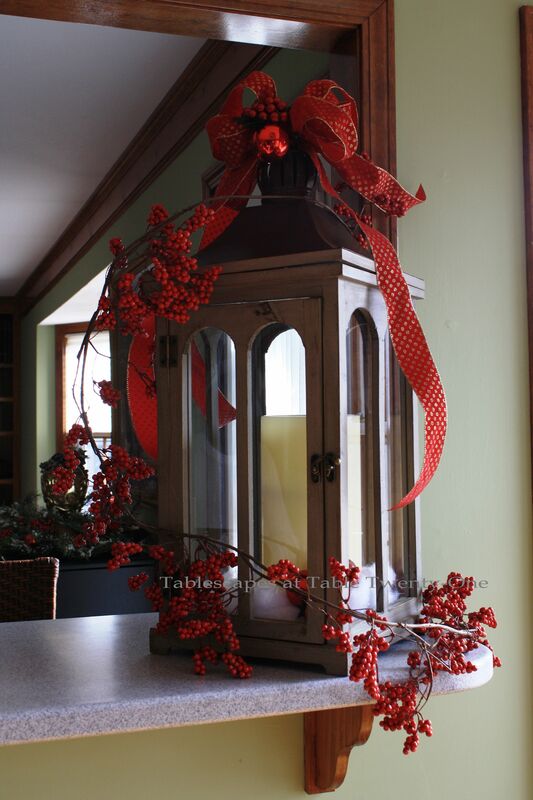 Moving from the family room into the kitchen, a large hurricane lantern is decorated for the holidays. 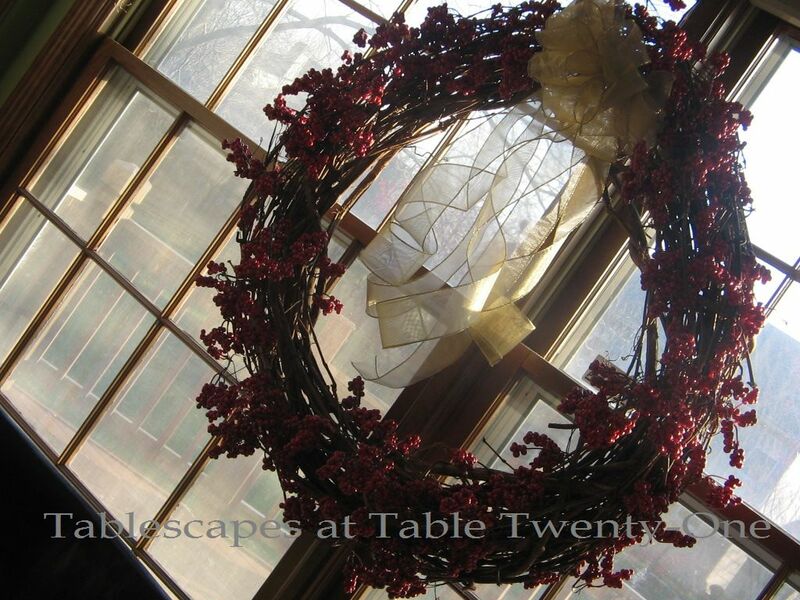 Centered in the window of the kitchen’s eating area is another grapevine wreath similar to the one in the living room. This one, however, is adorned with just a gossamer gold bow. I spend many tedious hours at the kitchen sink, so a little tree flanked by drying red chili peppers cheers the area. With the über crappy year we’ve had, it would be easy to simply throw up our hands, stuff our faces with Krispy Kremes, and be total Scrooges. We choose instead to put it all behind us and forge ahead…because what matters is that through it all, we have each other. ← Get Me to the Church On Time! Awesome! I thoroughly enjoyed every frame. Thanks for sharing. A very merry christmas to you and yours as well. Onward and Upward to better days. My goodness, that is one beautiful tree transformation! 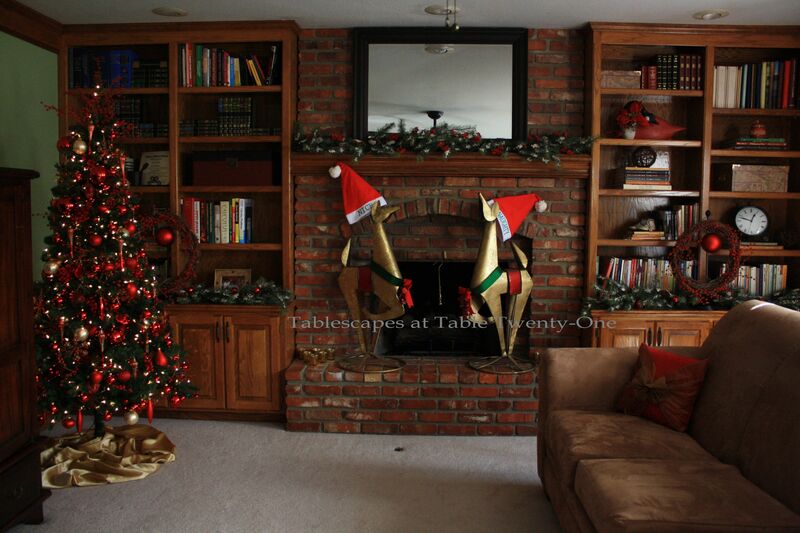 Those beautiful deer look so fun with their Santa hats on!!! Love it!! Love visiting you, Alicia! I got such a giggle looking at the “before and after” of your tree. It went from drab to fab! 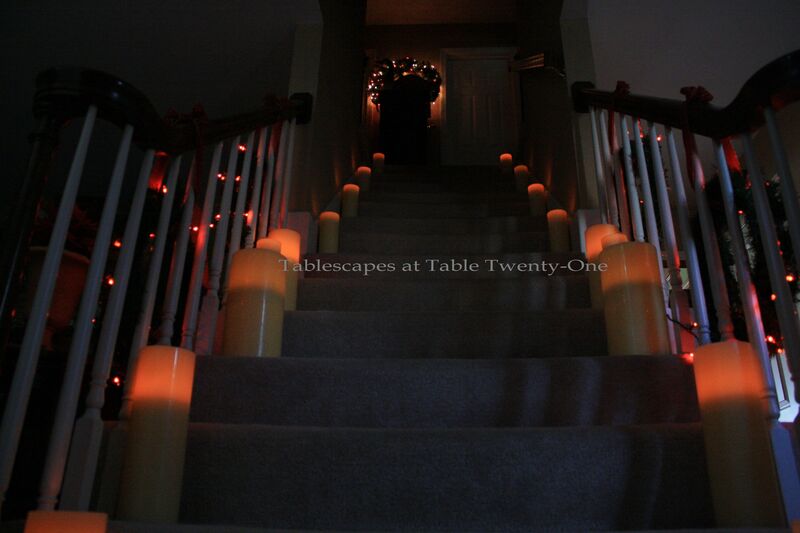 Great job and I love your entry stairway with the candles. Thanks for sharing your beautiful home. Here’s to peace and joy this Christmas, and an awesome New Year for you and Ramon! Wowza! Your tree is stunning!! Love the before and after transformation. The red makes your beautiful home feel warm and inviting. 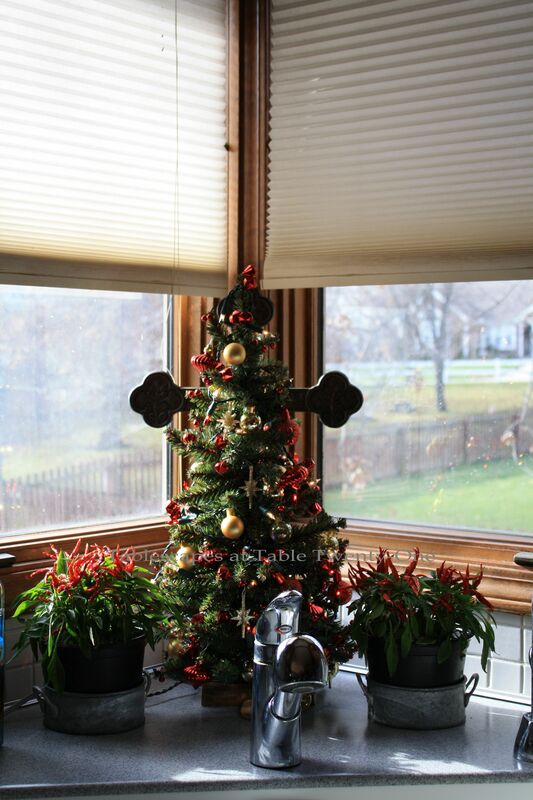 Your kitchen tree with the cross behind tells the reason for the season. Thank you for the tour. Merry Christmas! I brought hubby to your blog today so he could see your amazing blog. Your picture with hubby touched him… for the rest – well, he’s a guy – he’s glad WE enjoy doing those “things” 😉 ahahahahah. Things are a safe word when he’s commenting our “things”. Happy and Blessed Christmas Dear Alycia. Thank you for stopping by my blog and commenting. Awwwwwwww. 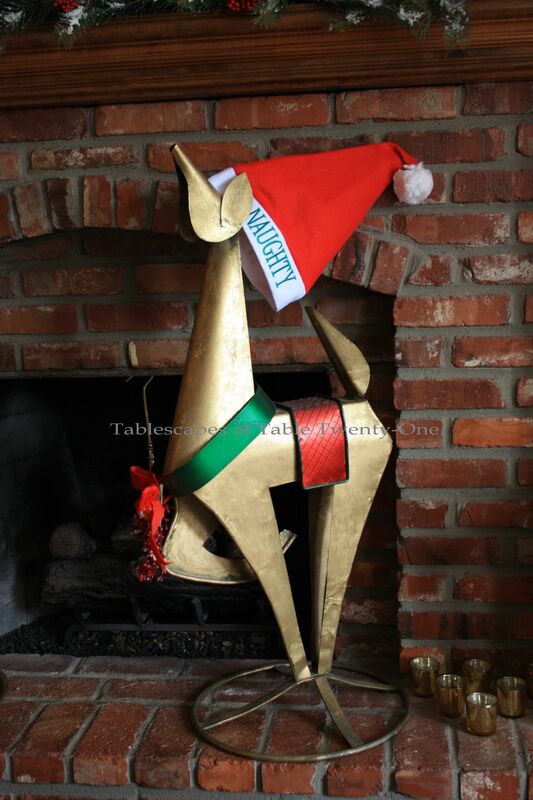 Brings tears to my eyes…seeing your lovely faces, and Santa hats smooching in front of the fire. how sweet is that? Love the tree transformation. it is beautiful. you know I love red. Your house is beautifully decorated for Christmas. Love it all Alycia. 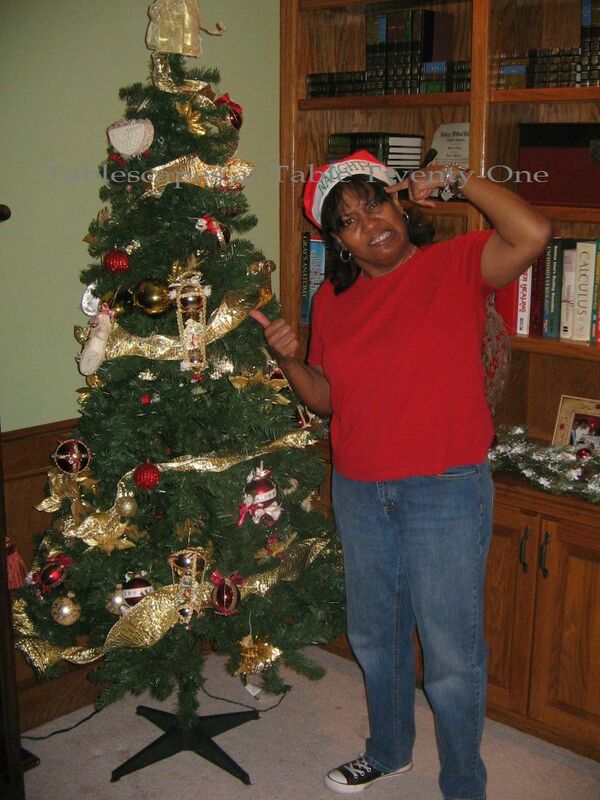 Alycia you turned that Charlie Brown Christmas Tree into a Gem! It looks beautiful! you have skills no doubt! I love the gold skirt below and I noticed immediately how pretty it was laid out. I love the lantern and your set up by the kitchen sink. Lord only knows we can use something of interest to look at when we’re doing dishes!! You and Ramon look so darn cute together! 2012 is going to be better- I just know it!! You have had a year for the books! My wish for you is that the sailing will be smoother, and you will be able to think of it as just a nightmare that is history. Your house looks beautiful! And you know I love all the red. Just beautiful. Merry Christmas ! Beautifully done Alycia! Wonderful post! 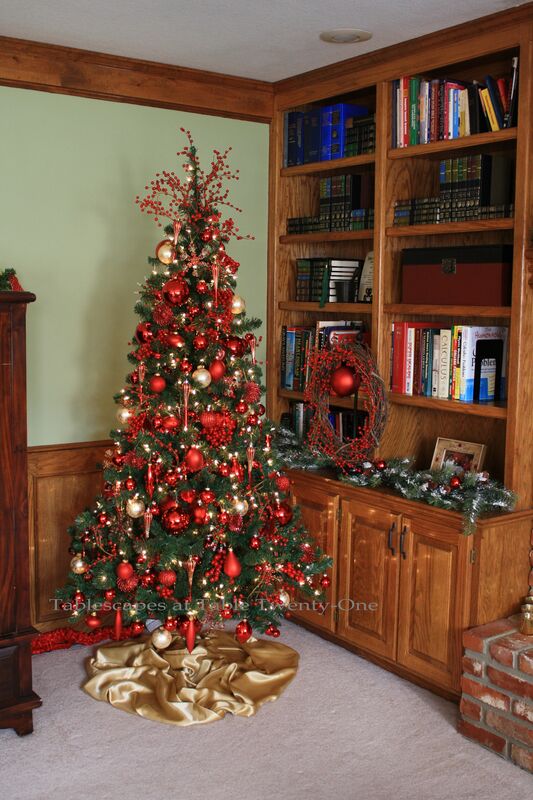 Red looks GREAT in your house!!! What a transformation on that tree! Love all the wreaths, too. Wonderful sentiment, Alycia. Love is everything. Merry Christmas, Alycia! Your home looks gorgeous! The tree transformation was amazing, the red decorations are just so pretty!! 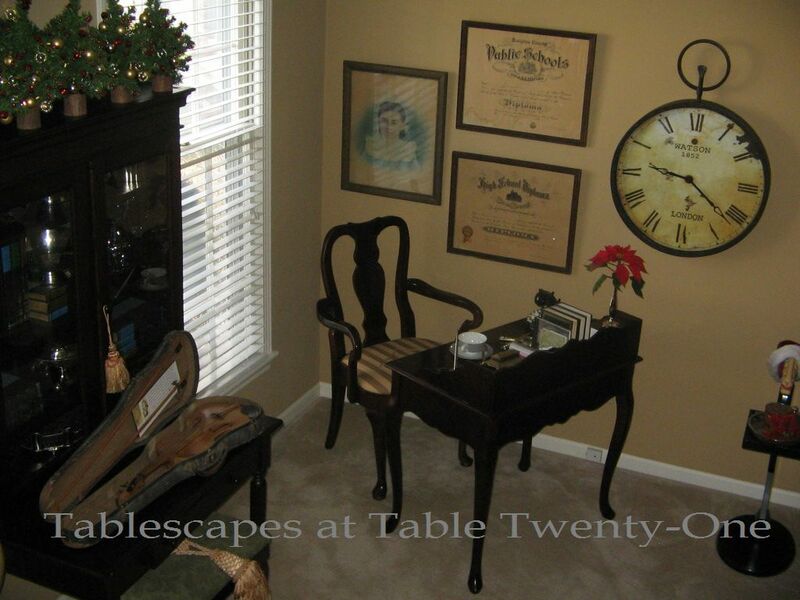 I’m sure the beauty of your home lifted your spirits this holiday season. Your positive attitude is inspiring! Hopefully 2012 will be a turn-around year for all of us. I wish for you and yours love, happiness, and prosperity!! Thanks for allowing us to take a peak at your lovely home!! Hi, Zuni! Happy New Year!!! I hope you had a good one! I was sick again, so we cancelled all plans. I’m feeling much better today, so I’m going to start to pull down Christmas decor. Do you have yours put away yet? Because I was sick last week, I’m still winding my way through all the ‘scapes on TT. I haven’t gotten to yours yet, so I’ll just hop over to your page. I don’t get the notice of your postings through email. What do I have to do for that to happen? I only get a few through email, but most of them come through that Blogger deal which I haven’t gotten used to checking daily. Anything good going on this week? I’ll spend most of my time cleaning, reorganizing, rearranging after Christmas. I’ll be at my cousin’s house on Friday helping her set up for her 30th wedding anniversary party on Saturday. She is *so* excited, and I want to help her make it really special. So that’s how I will spend my week! Gotta run. I have SO much to do!!! I hate taking down the tree. That is always the worst part, having to put each individual ornament back. Ugh![?] Have a wonderful day, and thanks for checking out my Christmas post!